Lady Elizabeth Fane has two choices: lose her family's Scottish stud farm or swallow her pride and beg Chico Fernandez for help. 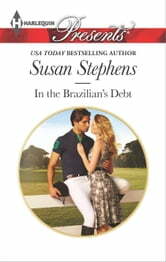 She's never forgiven the arrogant Brazilian polo star for abandoning her years before, so instead she will collect on the debt he owes her. Yet in the sultry Brazilian heat passions flare, revealing feelings Lizzie thought she had long conquered. That is until Chico finally reveals the truth behind his desertion and Lizzie realizes that he not only has power over her body but it's she who is in the Brazilian's debt!